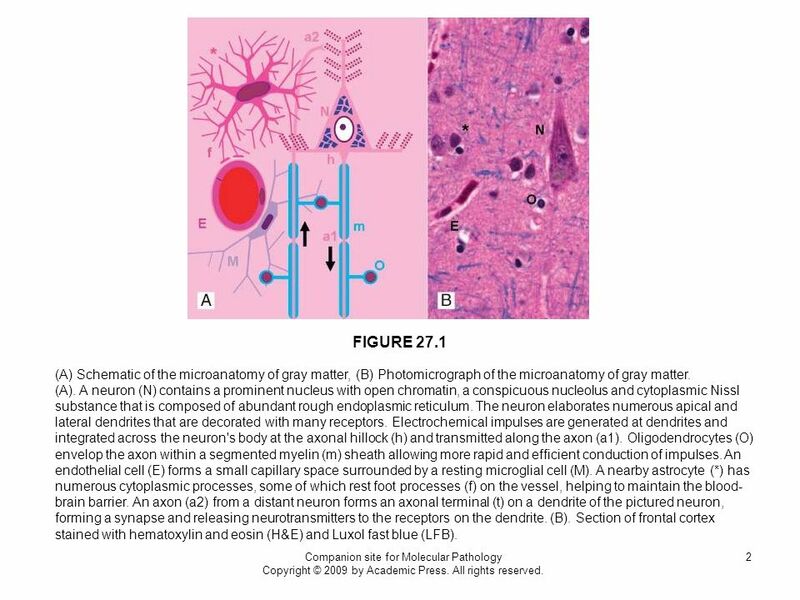 2 FIGURE 27.1 (A) Schematic of the microanatomy of gray matter, (B) Photomicrograph of the microanatomy of gray matter. (A). A neuron (N) contains a prominent nucleus with open chromatin, a conspicuous nucleolus and cytoplasmic Nissl substance that is composed of abundant rough endoplasmic reticulum. The neuron elaborates numerous apical and lateral dendrites that are decorated with many receptors. Electrochemical impulses are generated at dendrites and integrated across the neuron's body at the axonal hillock (h) and transmitted along the axon (a1). Oligodendrocytes (O) envelop the axon within a segmented myelin (m) sheath allowing more rapid and efficient conduction of impulses. An endothelial cell (E) forms a small capillary space surrounded by a resting microglial cell (M). A nearby astrocyte (*) has numerous cytoplasmic processes, some of which rest foot processes (f) on the vessel, helping to maintain the blood-brain barrier. An axon (a2) from a distant neuron forms an axonal terminal (t) on a dendrite of the pictured neuron, forming a synapse and releasing neurotransmitters to the receptors on the dendrite. (B). Section of frontal cortex stained with hematoxylin and eosin (H&E) and Luxol fast blue (LFB). Companion site for Molecular Pathology Copyright © 2009 by Academic Press. All rights reserved. 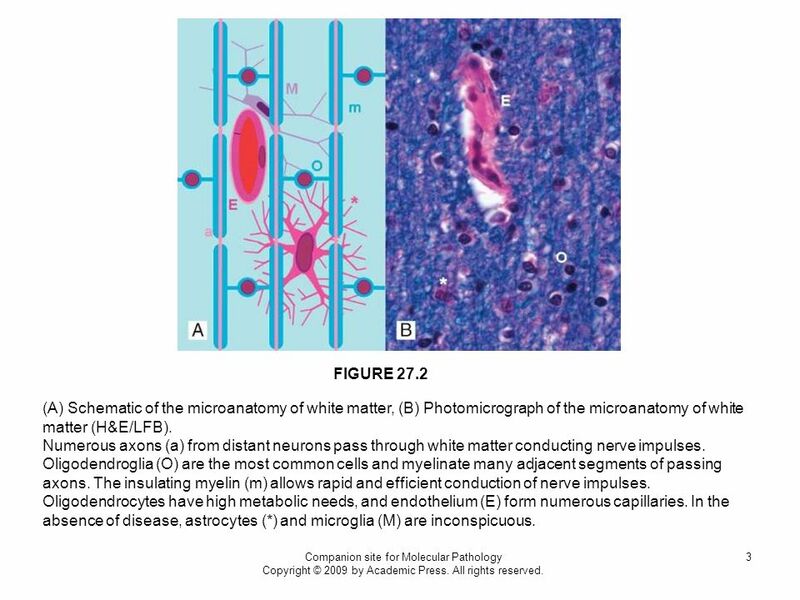 3 FIGURE 27.2 (A) Schematic of the microanatomy of white matter, (B) Photomicrograph of the microanatomy of white matter (H&E/LFB). Numerous axons (a) from distant neurons pass through white matter conducting nerve impulses. Oligodendroglia (O) are the most common cells and myelinate many adjacent segments of passing axons. The insulating myelin (m) allows rapid and efficient conduction of nerve impulses. Oligodendrocytes have high metabolic needs, and endothelium (E) form numerous capillaries. In the absence of disease, astrocytes (*) and microglia (M) are inconspicuous. Companion site for Molecular Pathology Copyright © 2009 by Academic Press. All rights reserved. 4 Lateral view of the central nervous system. 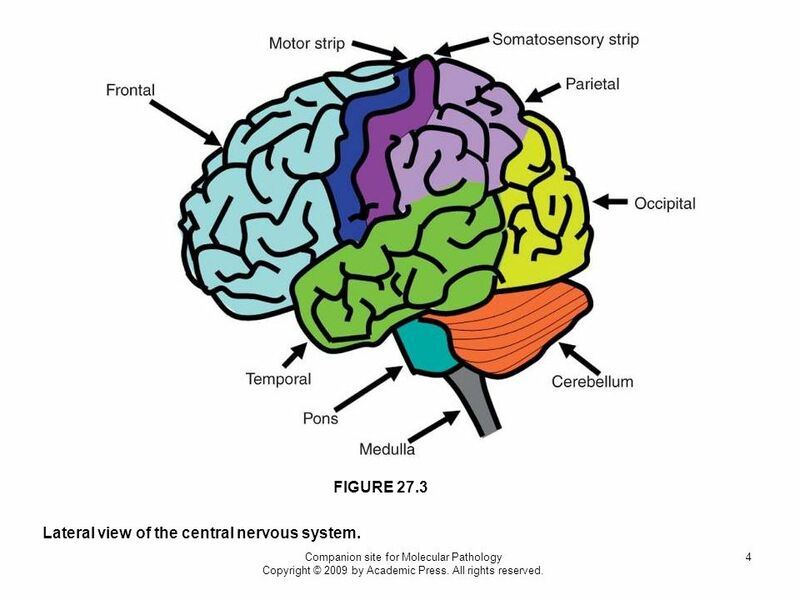 FIGURE 27.3 Lateral view of the central nervous system. Companion site for Molecular Pathology Copyright © 2009 by Academic Press. All rights reserved. 5 Coronal section of cerebrum through the deep gray matter nuclei. 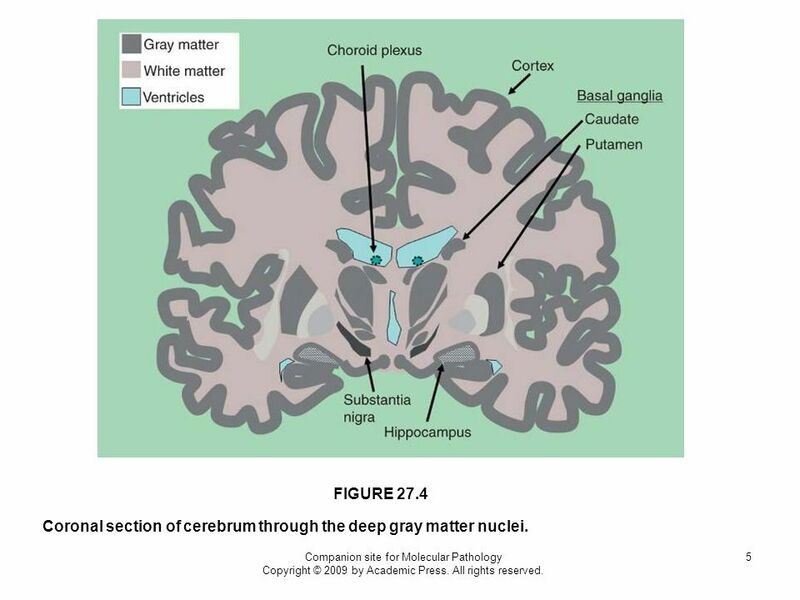 FIGURE 27.4 Coronal section of cerebrum through the deep gray matter nuclei. Companion site for Molecular Pathology Copyright © 2009 by Academic Press. All rights reserved. 6 FIGURE 27.5 Neural tube formation. 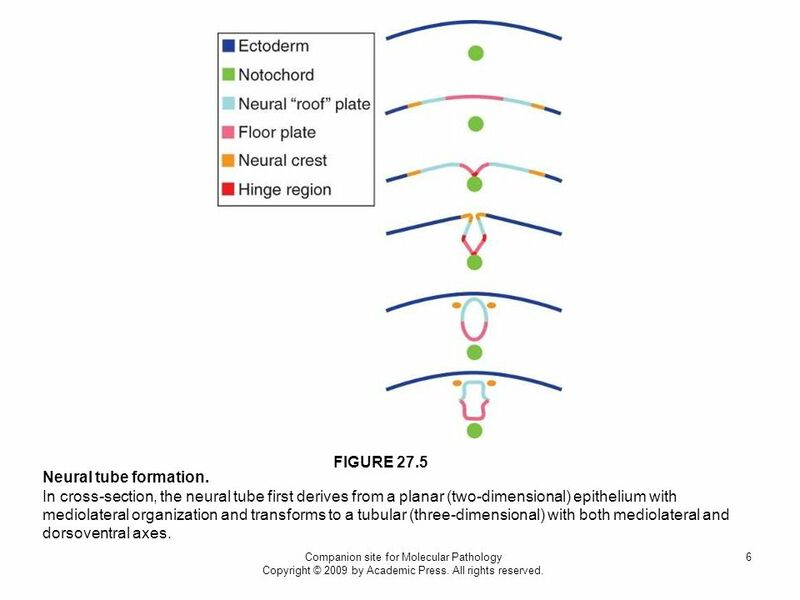 In cross-section, the neural tube first derives from a planar (two-dimensional) epithelium with mediolateral organization and transforms to a tubular (three-dimensional) with both mediolateral and dorsoventral axes. Companion site for Molecular Pathology Copyright © 2009 by Academic Press. All rights reserved. 7 Simplified schematic of the sequence of neural tube fusion. FIGURE 27.6 Simplified schematic of the sequence of neural tube fusion. After the neural tube begins closure from rostral and posterior cerebral sites, closure propagates anteriorly and posteriorly. 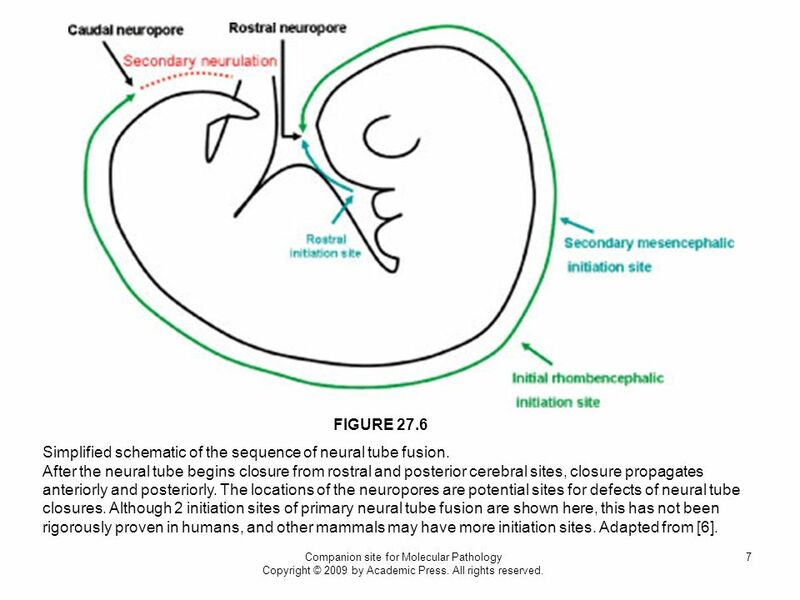 The locations of the neuropores are potential sites for defects of neural tube closures. Although 2 initiation sites of primary neural tube fusion are shown here, this has not been rigorously proven in humans, and other mammals may have more initiation sites. Adapted from . Companion site for Molecular Pathology Copyright © 2009 by Academic Press. All rights reserved. 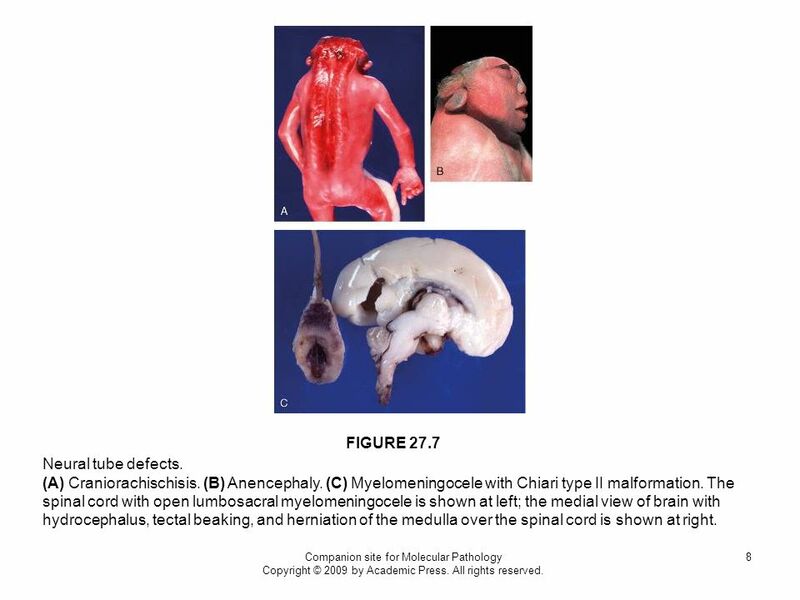 8 FIGURE 27.7 Neural tube defects. (A) Craniorachischisis. (B) Anencephaly. (C) Myelomeningocele with Chiari type II malformation. The spinal cord with open lumbosacral myelomeningocele is shown at left; the medial view of brain with hydrocephalus, tectal beaking, and herniation of the medulla over the spinal cord is shown at right. Companion site for Molecular Pathology Copyright © 2009 by Academic Press. All rights reserved. 9 Segmentation and cleavage of the developing brain. FIGURE 27.8 Segmentation and cleavage of the developing brain. (A) After fusion of the neural tube, the anterior-most portion forms swellings that will become the cerebrum (diencephalon), the midbrain (mesencephalon), and hindbrain (rhombencephalon). 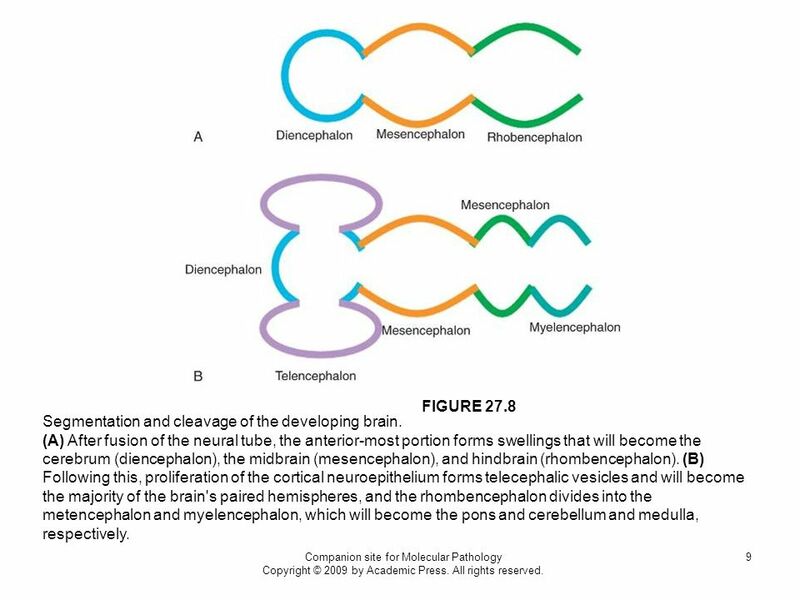 (B) Following this, proliferation of the cortical neuroepithelium forms telecephalic vesicles and will become the majority of the brain's paired hemispheres, and the rhombencephalon divides into the metencephalon and myelencephalon, which will become the pons and cerebellum and medulla, respectively. Companion site for Molecular Pathology Copyright © 2009 by Academic Press. All rights reserved. 10 Alobar holoprosencephaly in a 23-week gestational age fetus. 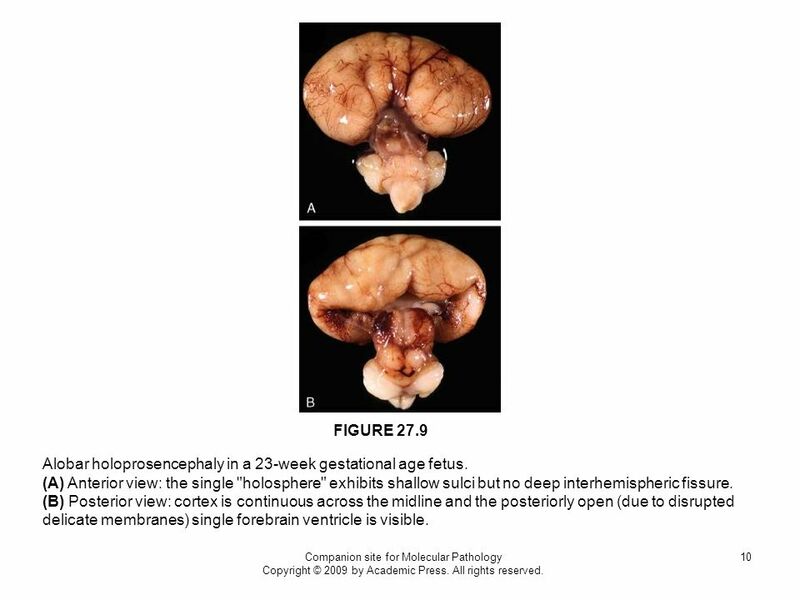 FIGURE 27.9 Alobar holoprosencephaly in a 23-week gestational age fetus. (A) Anterior view: the single "holosphere" exhibits shallow sulci but no deep interhemispheric fissure. (B) Posterior view: cortex is continuous across the midline and the posteriorly open (due to disrupted delicate membranes) single forebrain ventricle is visible. Companion site for Molecular Pathology Copyright © 2009 by Academic Press. All rights reserved. 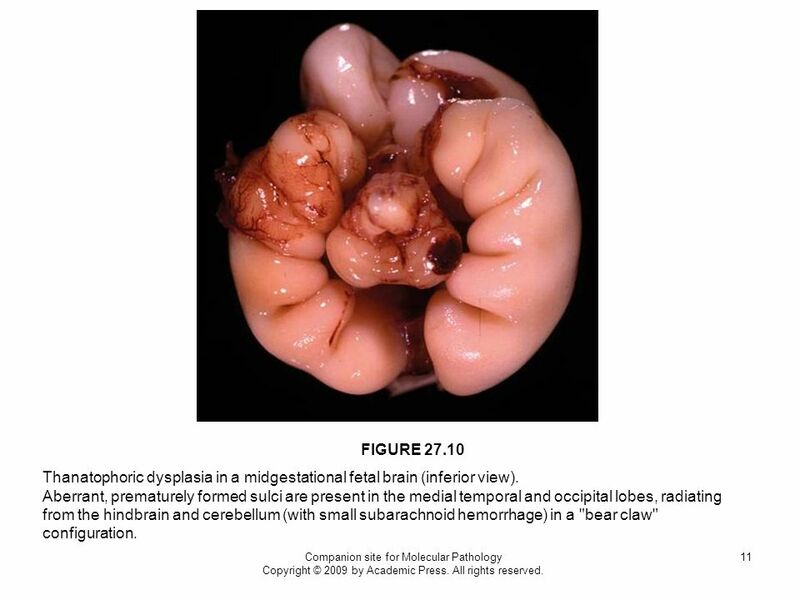 11 FIGURE 27.10 Thanatophoric dysplasia in a midgestational fetal brain (inferior view). 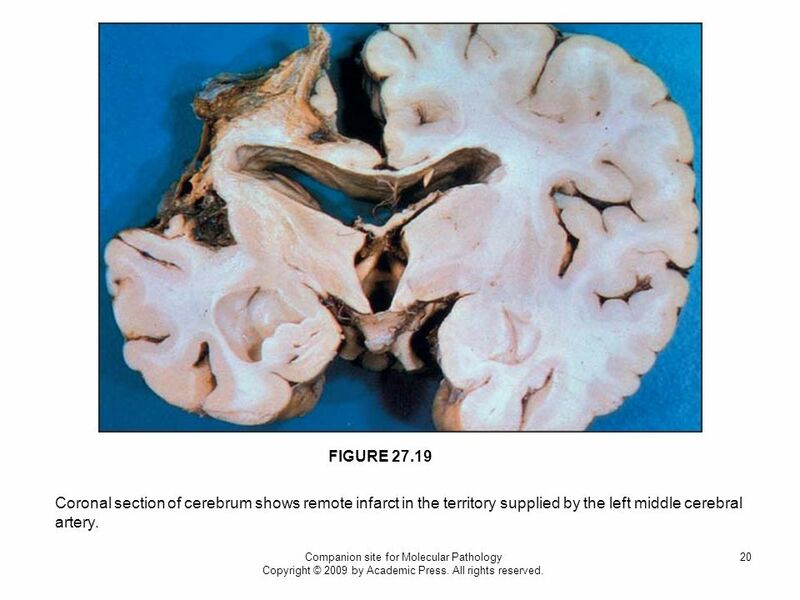 Aberrant, prematurely formed sulci are present in the medial temporal and occipital lobes, radiating from the hindbrain and cerebellum (with small subarachnoid hemorrhage) in a "bear claw" configuration. Companion site for Molecular Pathology Copyright © 2009 by Academic Press. All rights reserved. 12 Defects of cortical differentiation or migration. FIGURE 27.11 Defects of cortical differentiation or migration. (A) Lissencephaly (type I) in Miller-Dieker syndrome (lateral view). The sulci are extraordinarily shallow, lending the brain surface a smooth surface appearance. 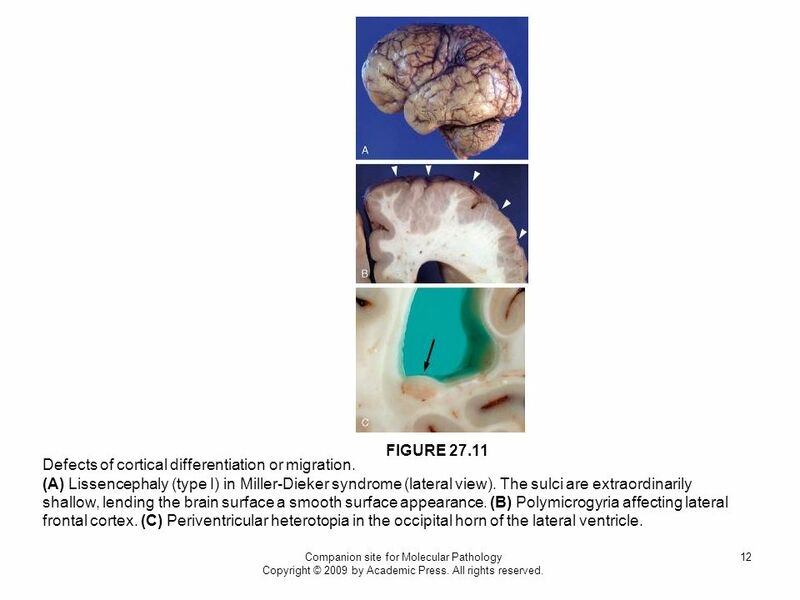 (B) Polymicrogyria affecting lateral frontal cortex. (C) Periventricular heterotopia in the occipital horn of the lateral ventricle. Companion site for Molecular Pathology Copyright © 2009 by Academic Press. All rights reserved. 13 Agenesis of the corpus callosum. FIGURE 27.12 Agenesis of the corpus callosum. (A) Medial view: the corpus callosum is absent and the cingulate gyrus and sulcus are malformed. 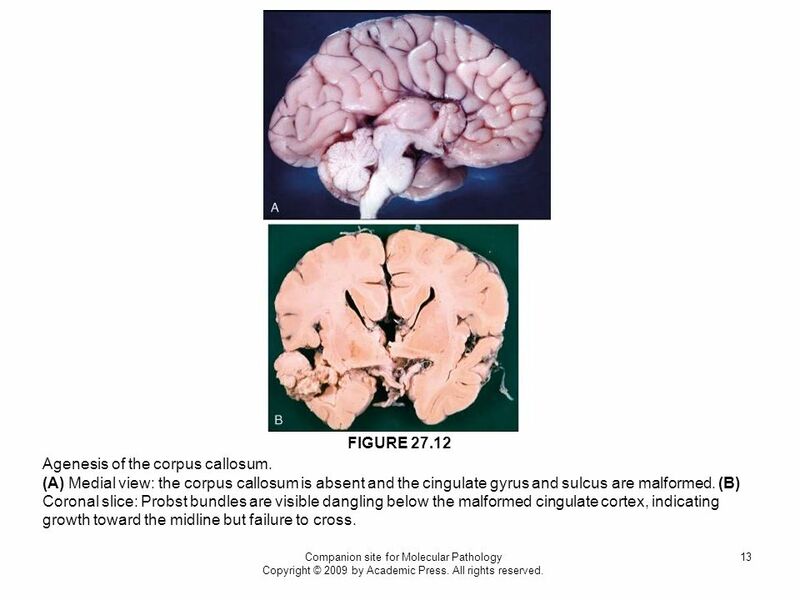 (B) Coronal slice: Probst bundles are visible dangling below the malformed cingulate cortex, indicating growth toward the midline but failure to cross. Companion site for Molecular Pathology Copyright © 2009 by Academic Press. All rights reserved. 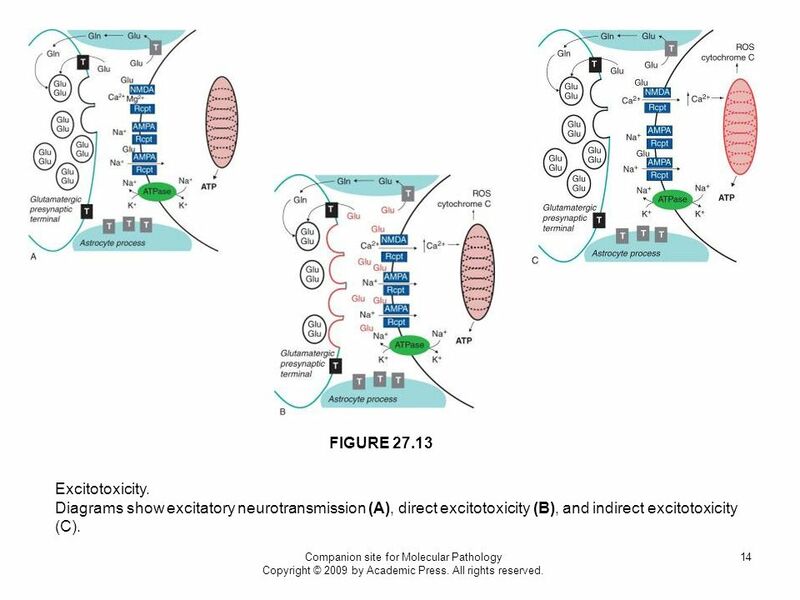 Diagrams show excitatory neurotransmission (A), direct excitotoxicity (B), and indirect excitotoxicity (C). Companion site for Molecular Pathology Copyright © 2009 by Academic Press. All rights reserved. 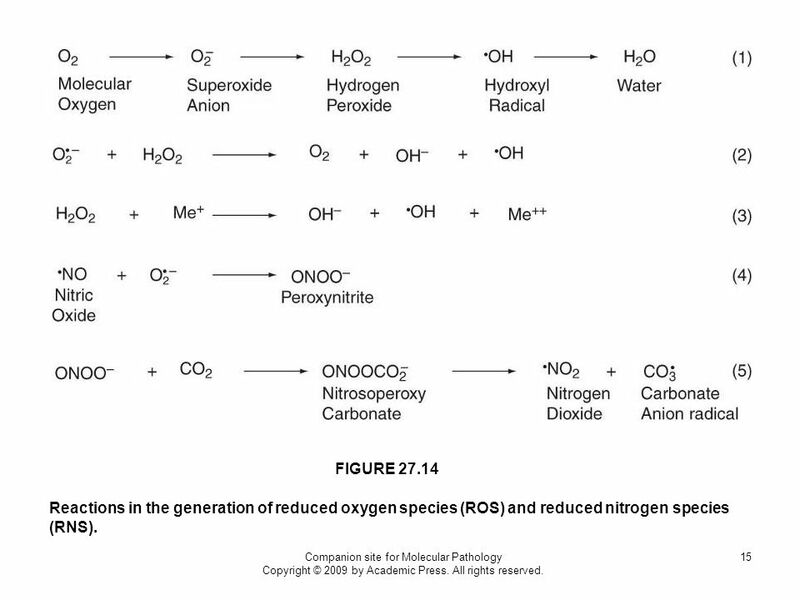 15 FIGURE 27.14 Reactions in the generation of reduced oxygen species (ROS) and reduced nitrogen species (RNS). Companion site for Molecular Pathology Copyright © 2009 by Academic Press. All rights reserved. 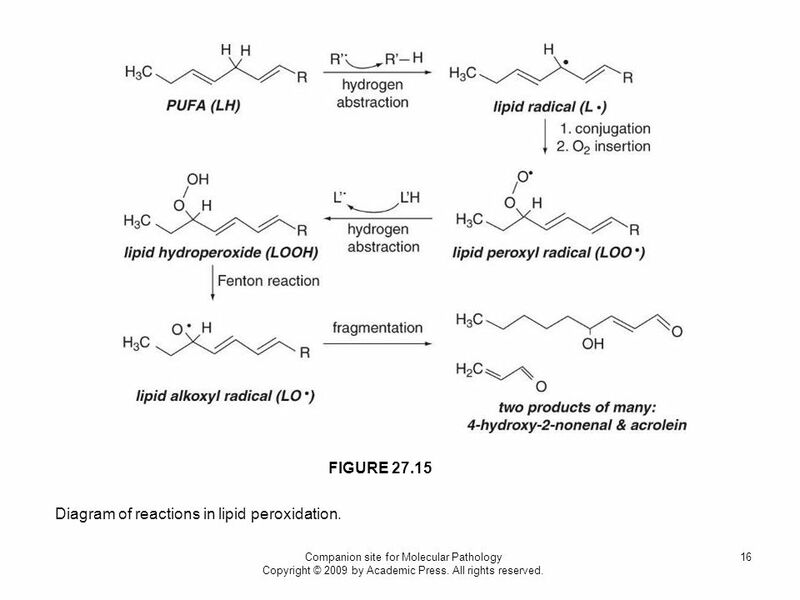 16 Diagram of reactions in lipid peroxidation. FIGURE 27.15 Diagram of reactions in lipid peroxidation. Companion site for Molecular Pathology Copyright © 2009 by Academic Press. All rights reserved. 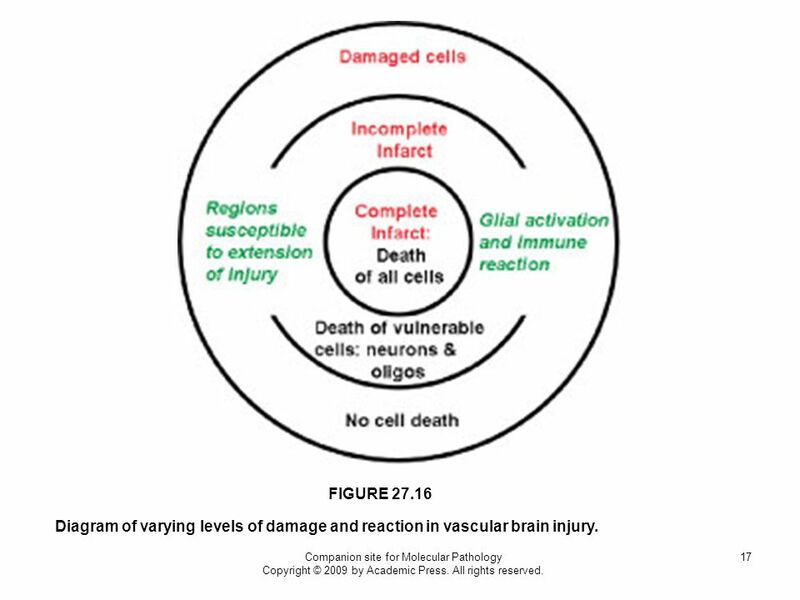 17 FIGURE 27.16 Diagram of varying levels of damage and reaction in vascular brain injury. Companion site for Molecular Pathology Copyright © 2009 by Academic Press. All rights reserved. 18 FIGURE 27.17 Red neuron. 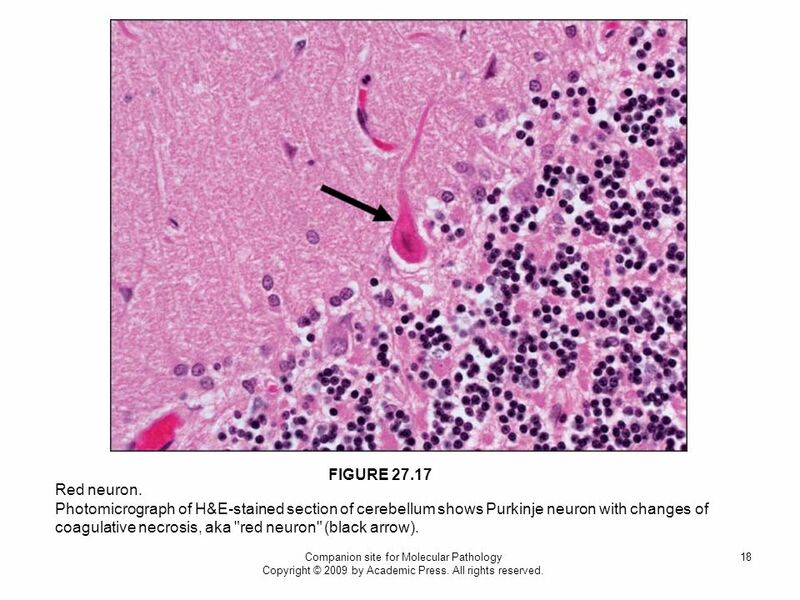 Photomicrograph of H&E-stained section of cerebellum shows Purkinje neuron with changes of coagulative necrosis, aka "red neuron" (black arrow). Companion site for Molecular Pathology Copyright © 2009 by Academic Press. All rights reserved. 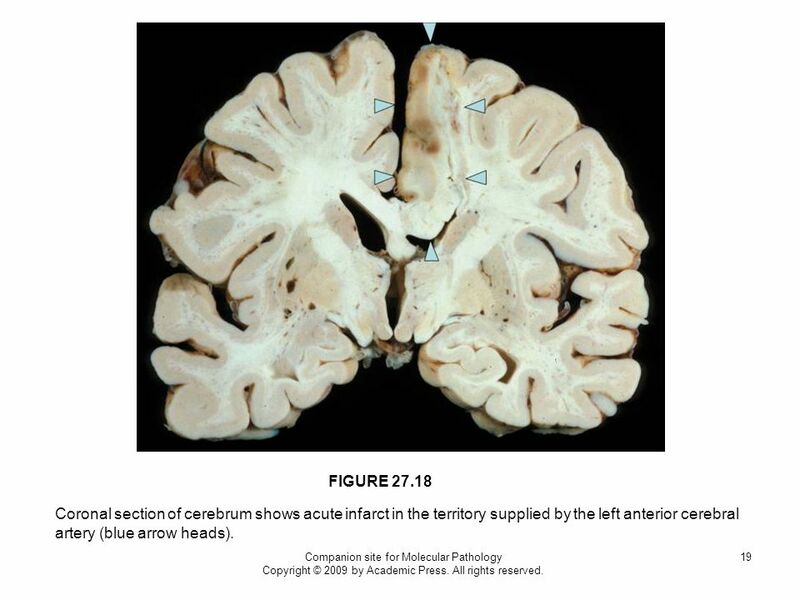 19 FIGURE 27.18 Coronal section of cerebrum shows acute infarct in the territory supplied by the left anterior cerebral artery (blue arrow heads). Companion site for Molecular Pathology Copyright © 2009 by Academic Press. All rights reserved. 20 FIGURE 27.19 Coronal section of cerebrum shows remote infarct in the territory supplied by the left middle cerebral artery. Companion site for Molecular Pathology Copyright © 2009 by Academic Press. All rights reserved. 21 FIGURE 27.20 Thrombosis. 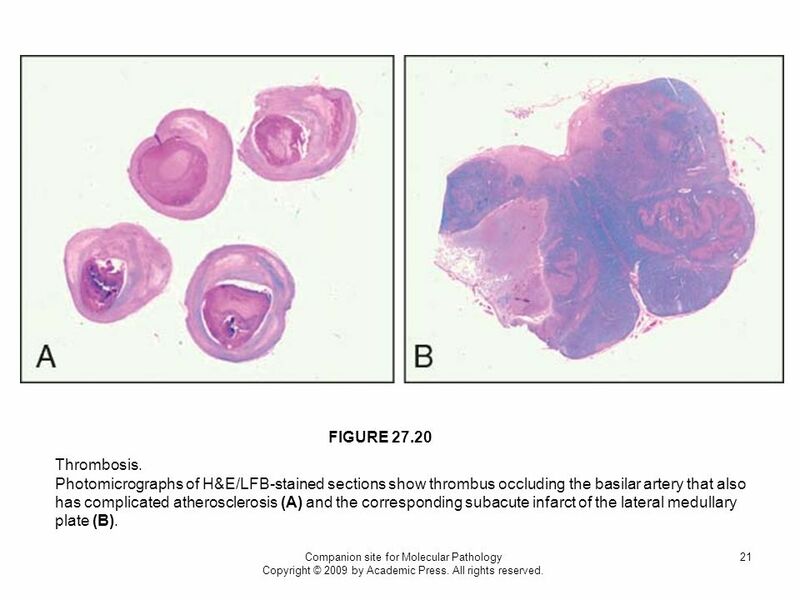 Photomicrographs of H&E/LFB-stained sections show thrombus occluding the basilar artery that also has complicated atherosclerosis (A) and the corresponding subacute infarct of the lateral medullary plate (B). Companion site for Molecular Pathology Copyright © 2009 by Academic Press. All rights reserved. 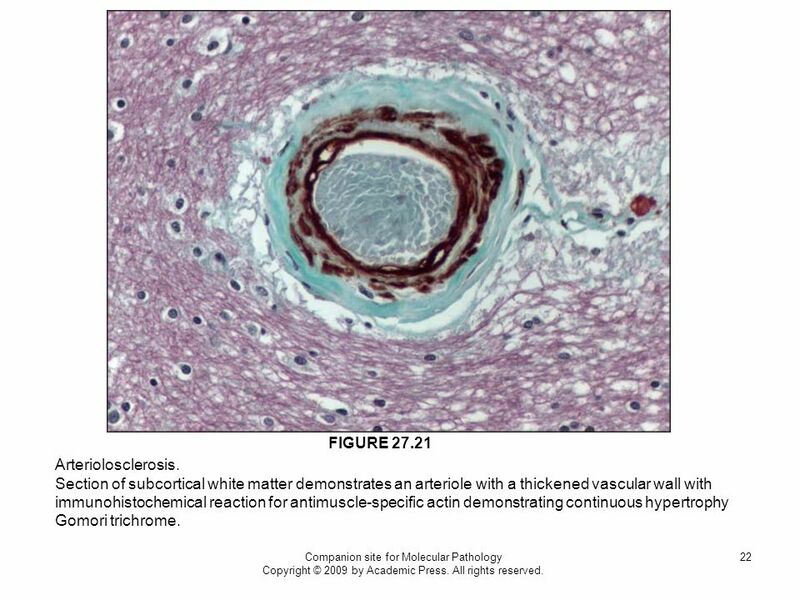 Section of subcortical white matter demonstrates an arteriole with a thickened vascular wall with immunohistochemical reaction for antimuscle-specific actin demonstrating continuous hypertrophy Gomori trichrome. Companion site for Molecular Pathology Copyright © 2009 by Academic Press. All rights reserved. 23 FIGURE 27.22 Lacunar infarct. 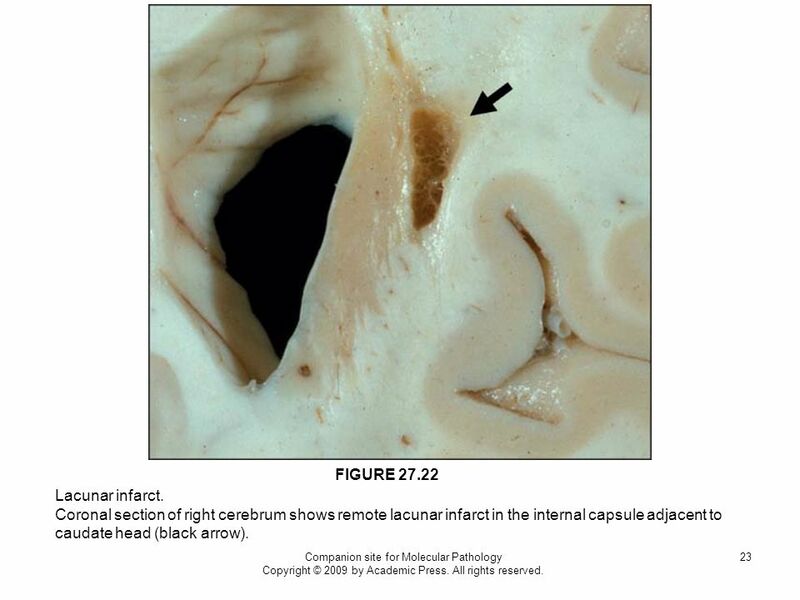 Coronal section of right cerebrum shows remote lacunar infarct in the internal capsule adjacent to caudate head (black arrow). Companion site for Molecular Pathology Copyright © 2009 by Academic Press. All rights reserved. 24 Small vessel in CADASIL. 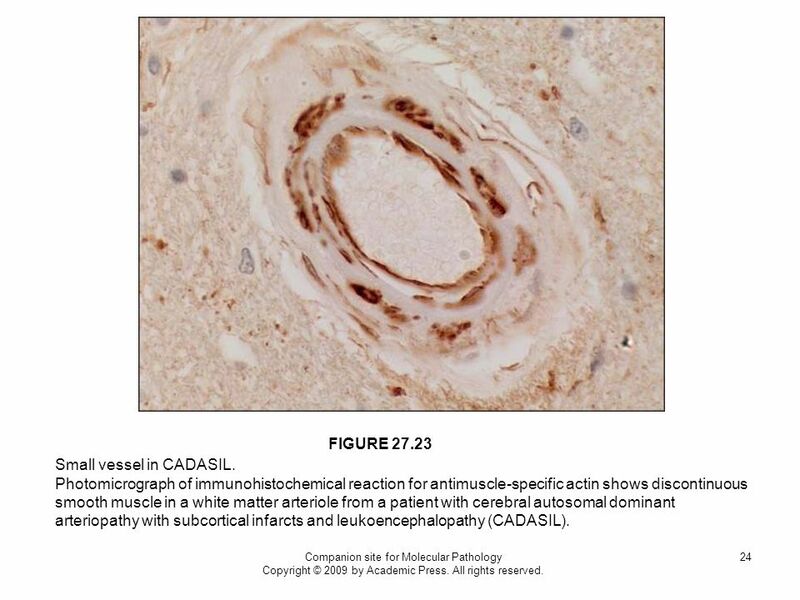 FIGURE 27.23 Small vessel in CADASIL. Photomicrograph of immunohistochemical reaction for antimuscle-specific actin shows discontinuous smooth muscle in a white matter arteriole from a patient with cerebral autosomal dominant arteriopathy with subcortical infarcts and leukoencephalopathy (CADASIL). Companion site for Molecular Pathology Copyright © 2009 by Academic Press. All rights reserved. 25 FIGURE 27.24 Hemorrhage. 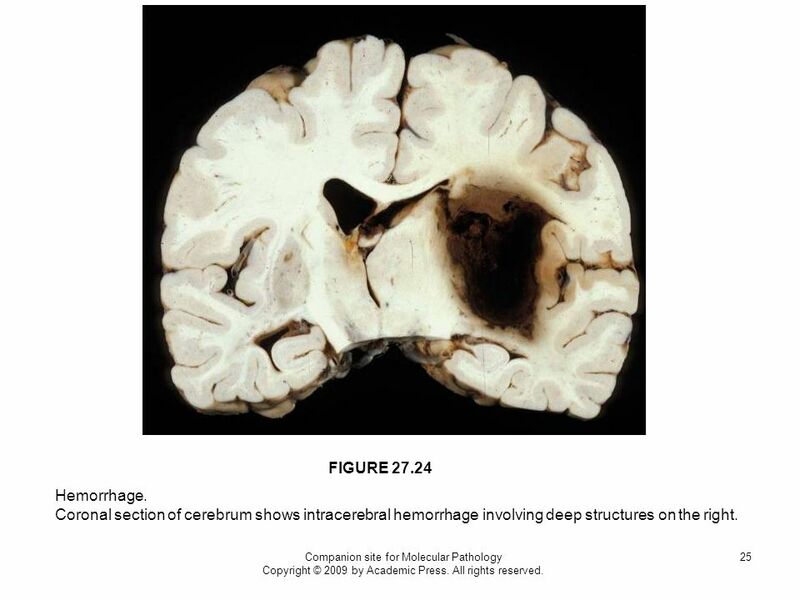 Coronal section of cerebrum shows intracerebral hemorrhage involving deep structures on the right. Companion site for Molecular Pathology Copyright © 2009 by Academic Press. All rights reserved. 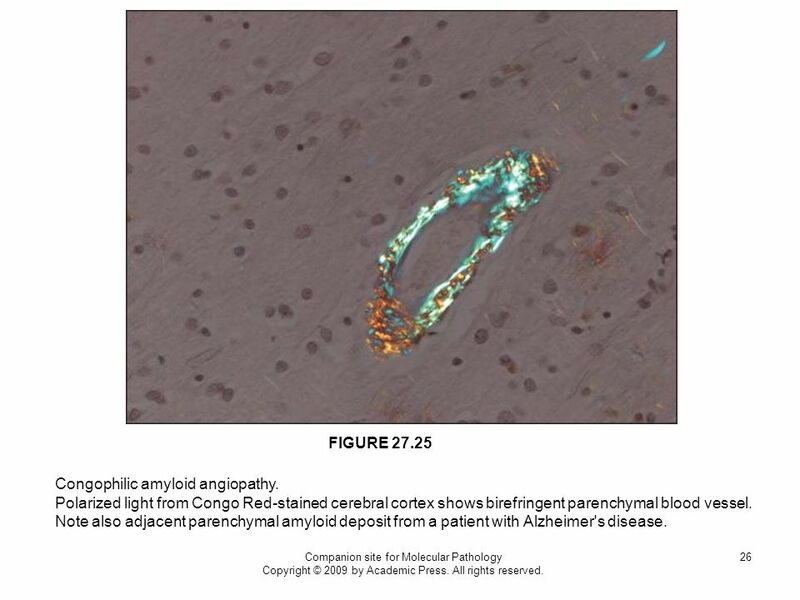 FIGURE 27.25 Congophilic amyloid angiopathy. Polarized light from Congo Red-stained cerebral cortex shows birefringent parenchymal blood vessel. Note also adjacent parenchymal amyloid deposit from a patient with Alzheimer's disease. Companion site for Molecular Pathology Copyright © 2009 by Academic Press. All rights reserved. 27 Proteinaceous inclusions of neurodegenerative diseases. 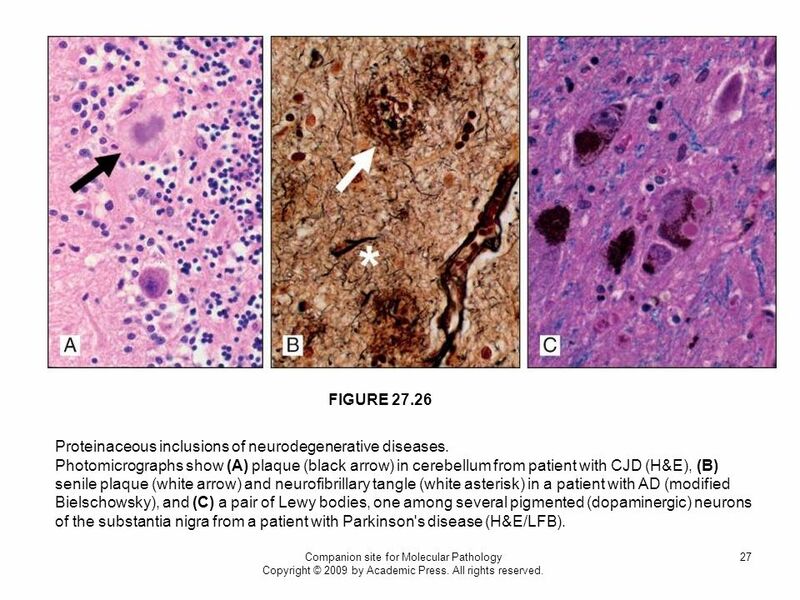 FIGURE 27.26 Proteinaceous inclusions of neurodegenerative diseases. Photomicrographs show (A) plaque (black arrow) in cerebellum from patient with CJD (H&E), (B) senile plaque (white arrow) and neurofibrillary tangle (white asterisk) in a patient with AD (modified Bielschowsky), and (C) a pair of Lewy bodies, one among several pigmented (dopaminergic) neurons of the substantia nigra from a patient with Parkinson's disease (H&E/LFB). Companion site for Molecular Pathology Copyright © 2009 by Academic Press. All rights reserved. 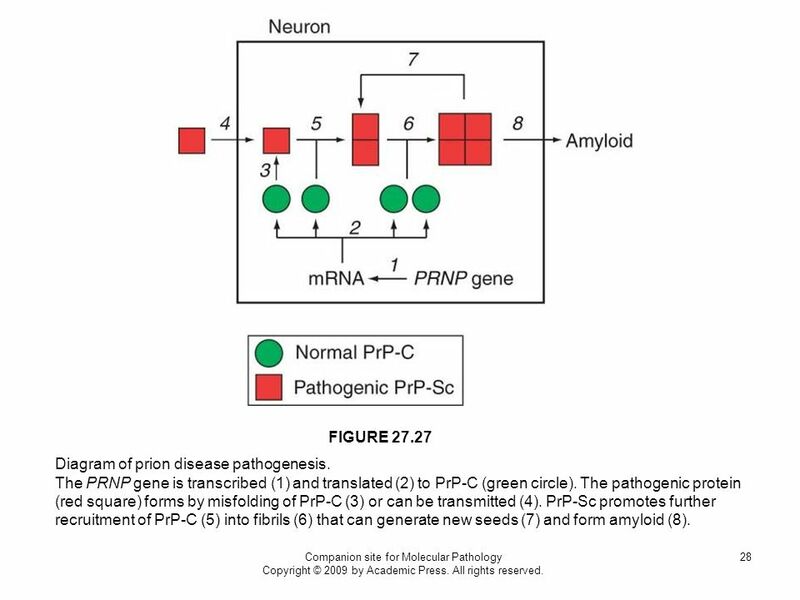 28 Diagram of prion disease pathogenesis. FIGURE 27.27 Diagram of prion disease pathogenesis. The PRNP gene is transcribed (1) and translated (2) to PrP-C (green circle). The pathogenic protein (red square) forms by misfolding of PrP-C (3) or can be transmitted (4). PrP-Sc promotes further recruitment of PrP-C (5) into fibrils (6) that can generate new seeds (7) and form amyloid (8). Companion site for Molecular Pathology Copyright © 2009 by Academic Press. All rights reserved. 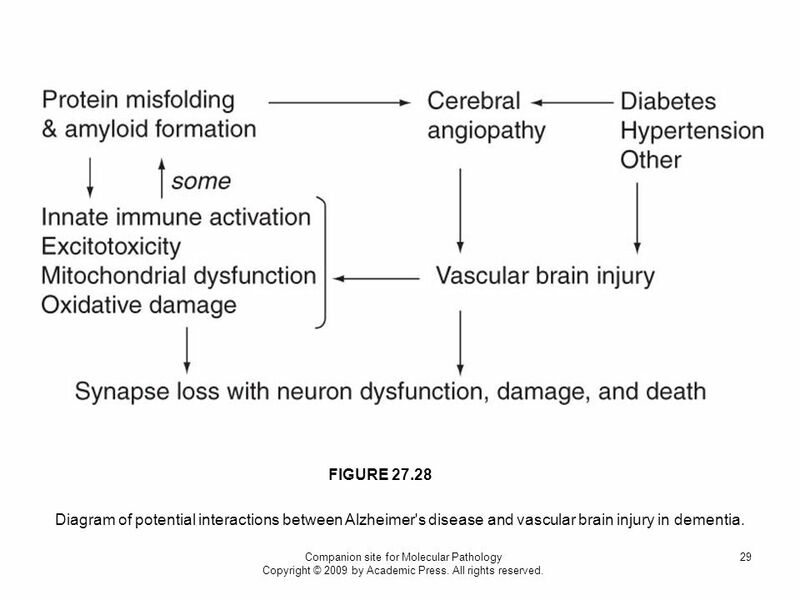 29 FIGURE 27.28 Diagram of potential interactions between Alzheimer's disease and vascular brain injury in dementia. Companion site for Molecular Pathology Copyright © 2009 by Academic Press. All rights reserved. 30 Structures for domoic acid and L-glutamate. 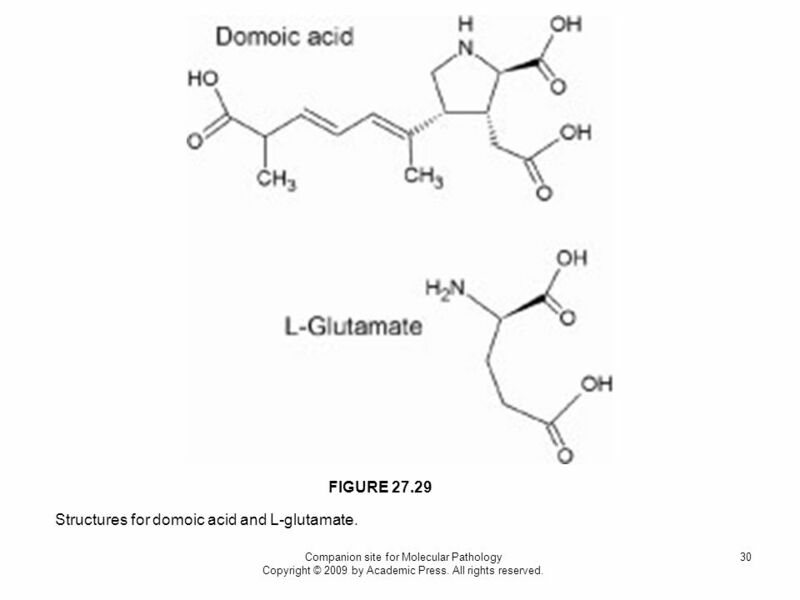 FIGURE 27.29 Structures for domoic acid and L-glutamate. Companion site for Molecular Pathology Copyright © 2009 by Academic Press. All rights reserved. 31 Diagram of steps in dopaminergic toxicity from MPTP exposure. FIGURE 27.30 Diagram of steps in dopaminergic toxicity from MPTP exposure. 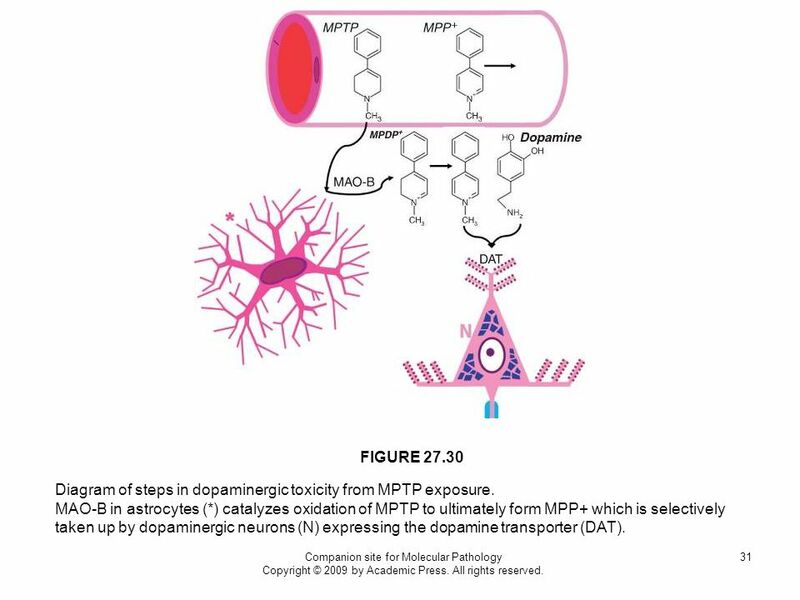 MAO-B in astrocytes (*) catalyzes oxidation of MPTP to ultimately form MPP+ which is selectively taken up by dopaminergic neurons (N) expressing the dopamine transporter (DAT). Companion site for Molecular Pathology Copyright © 2009 by Academic Press. All rights reserved. 32 Photomicrograph of diffuse astrocytoma. 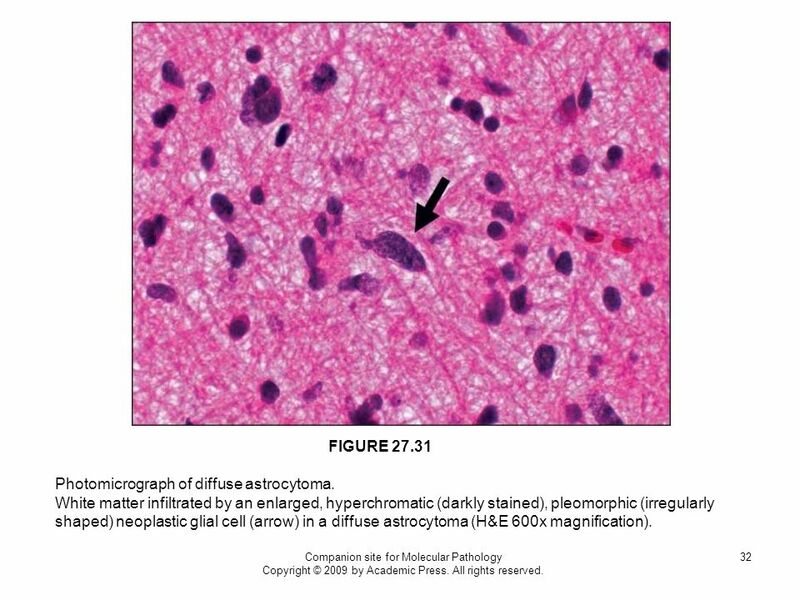 FIGURE 27.31 Photomicrograph of diffuse astrocytoma. White matter infiltrated by an enlarged, hyperchromatic (darkly stained), pleomorphic (irregularly shaped) neoplastic glial cell (arrow) in a diffuse astrocytoma (H&E 600x magnification). Companion site for Molecular Pathology Copyright © 2009 by Academic Press. All rights reserved. 33 Photomicrograph of an anaplastic astrocytoma. FIGURE 27.32 Photomicrograph of an anaplastic astrocytoma. Numerous enlarged, hyperchromatic (darkly stained) neoplastic glial nuclei have infiltrated brain parenchyma in this anaplastic astrocytoma. A mitotic figure (white arrow) is present. 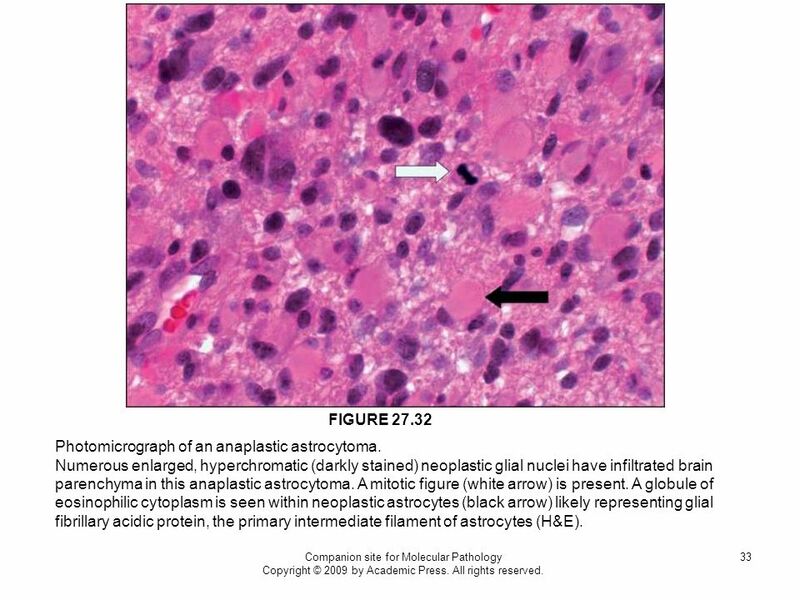 A globule of eosinophilic cytoplasm is seen within neoplastic astrocytes (black arrow) likely representing glial fibrillary acidic protein, the primary intermediate filament of astrocytes (H&E). Companion site for Molecular Pathology Copyright © 2009 by Academic Press. All rights reserved. 34 FIGURE 27.33 Genetic alterations associated with primary and secondary glioblastoma. Adapted from . Companion site for Molecular Pathology Copyright © 2009 by Academic Press. All rights reserved. 35 Molecular pathways implicated in gliomagenesis. 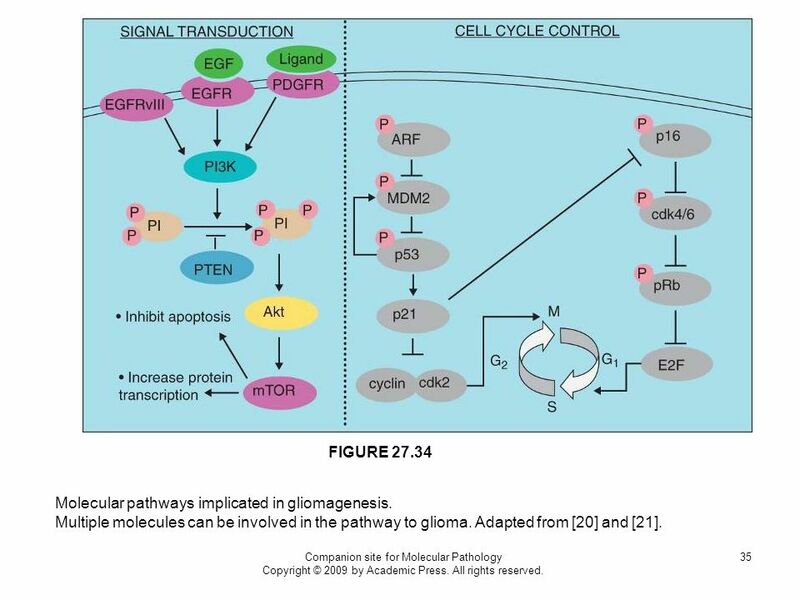 FIGURE 27.34 Molecular pathways implicated in gliomagenesis. Multiple molecules can be involved in the pathway to glioma. Adapted from  and . Companion site for Molecular Pathology Copyright © 2009 by Academic Press. All rights reserved. FIGURE 27.35 Photomicrograph of glioblastoma. (A) Sections from a brain infiltrated by glioblastoma stained with H&E at 100x magnification and (B) 600x magnification (below left). A line of parallel nuclei forming a pseudopalisade can be seen extending from the panel above through the left lower panel. The pseudopalisade is adjacent to necrosis. A neuron can be seen surrounded by neoplastic cells (arrow). (C) The collagen network of a proliferative vessel is highlighted blue-green by a trichrome stain. Companion site for Molecular Pathology Copyright © 2009 by Academic Press. All rights reserved. 37 Progression from anaplastic astrocytoma (AA) to glioblastoma (GBM). 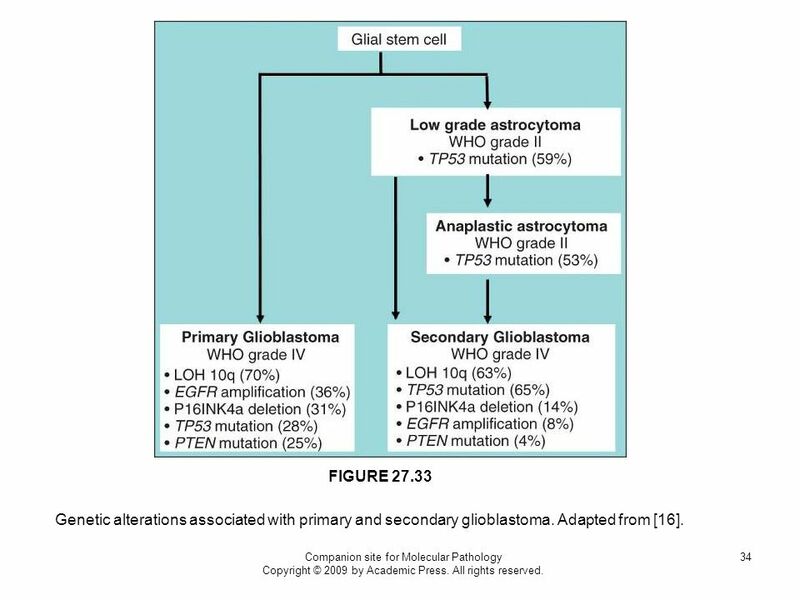 FIGURE 27.36 Progression from anaplastic astrocytoma (AA) to glioblastoma (GBM). (A) AA is mitotically active producing an area of hypercellularity, but no necrosis or vascular cell hyperplasia. 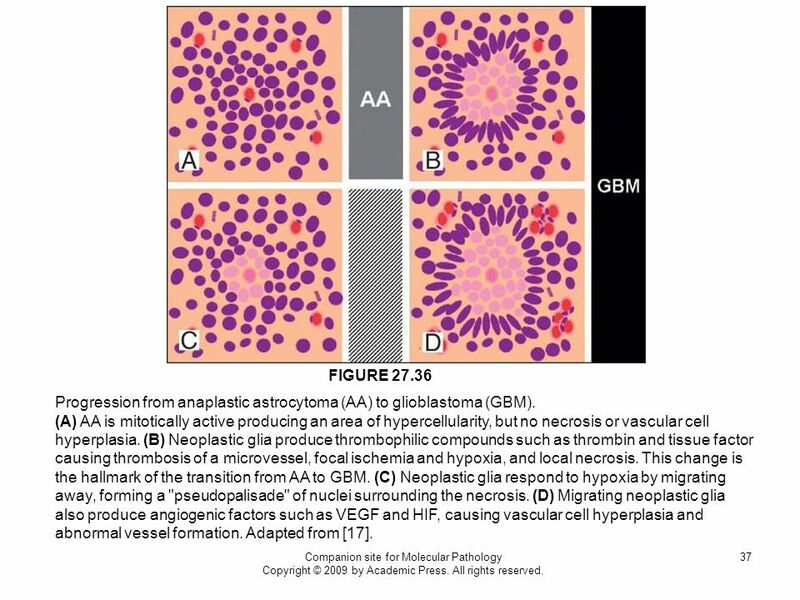 (B) Neoplastic glia produce thrombophilic compounds such as thrombin and tissue factor causing thrombosis of a microvessel, focal ischemia and hypoxia, and local necrosis. This change is the hallmark of the transition from AA to GBM. 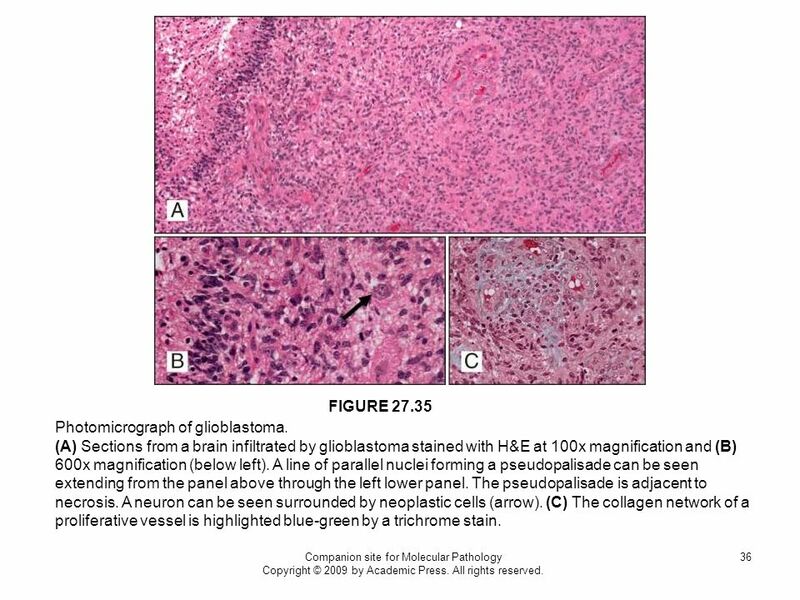 (C) Neoplastic glia respond to hypoxia by migrating away, forming a "pseudopalisade" of nuclei surrounding the necrosis. (D) Migrating neoplastic glia also produce angiogenic factors such as VEGF and HIF, causing vascular cell hyperplasia and abnormal vessel formation. Adapted from . Companion site for Molecular Pathology Copyright © 2009 by Academic Press. All rights reserved. FIGURE 27.37 Photomicrograph of oligodendroglioma. 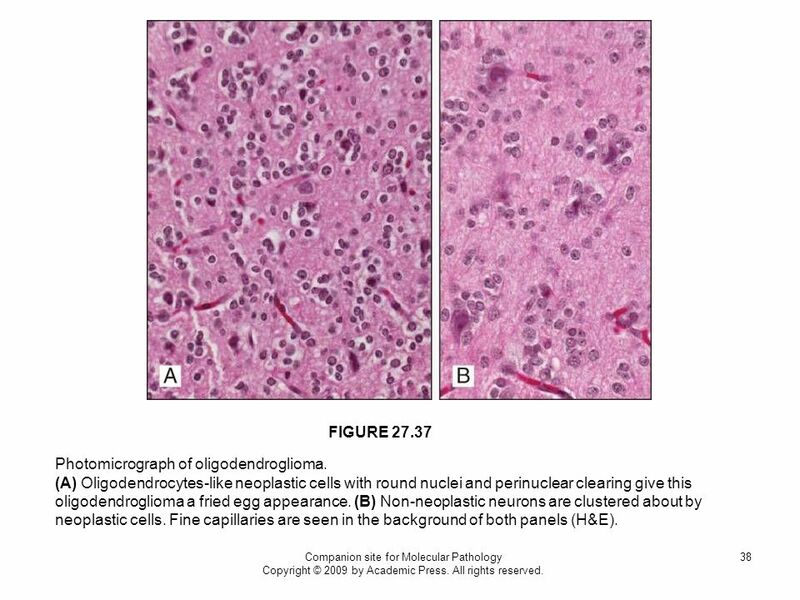 (A) Oligodendrocytes-like neoplastic cells with round nuclei and perinuclear clearing give this oligodendroglioma a fried egg appearance. (B) Non-neoplastic neurons are clustered about by neoplastic cells. Fine capillaries are seen in the background of both panels (H&E). Companion site for Molecular Pathology Copyright © 2009 by Academic Press. All rights reserved. 39 Two pathways implicated in medulloblastoma. 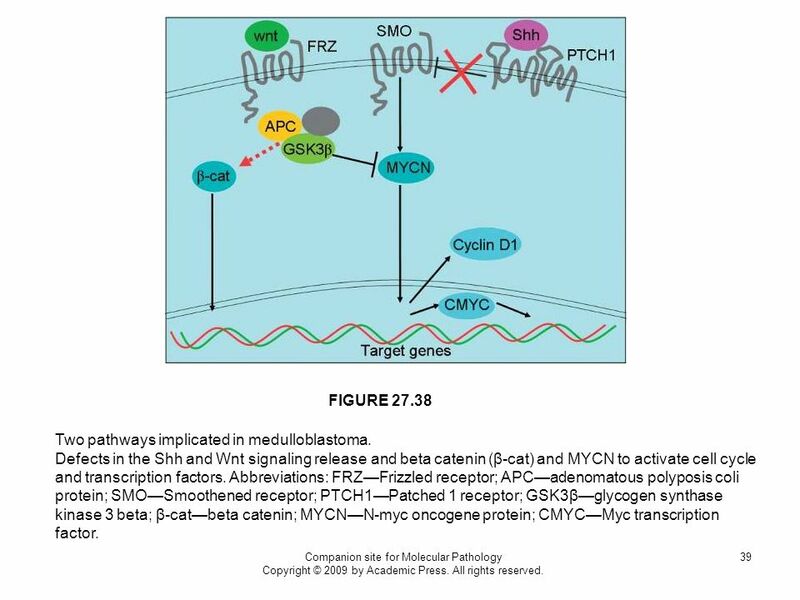 FIGURE 27.38 Two pathways implicated in medulloblastoma. Defects in the Shh and Wnt signaling release and beta catenin (β-cat) and MYCN to activate cell cycle and transcription factors. Abbreviations: FRZ—Frizzled receptor; APC—adenomatous polyposis coli protein; SMO—Smoothened receptor; PTCH1—Patched 1 receptor; GSK3β—glycogen synthase kinase 3 beta; β-cat—beta catenin; MYCN—N-myc oncogene protein; CMYC—Myc transcription factor. Companion site for Molecular Pathology Copyright © 2009 by Academic Press. All rights reserved. 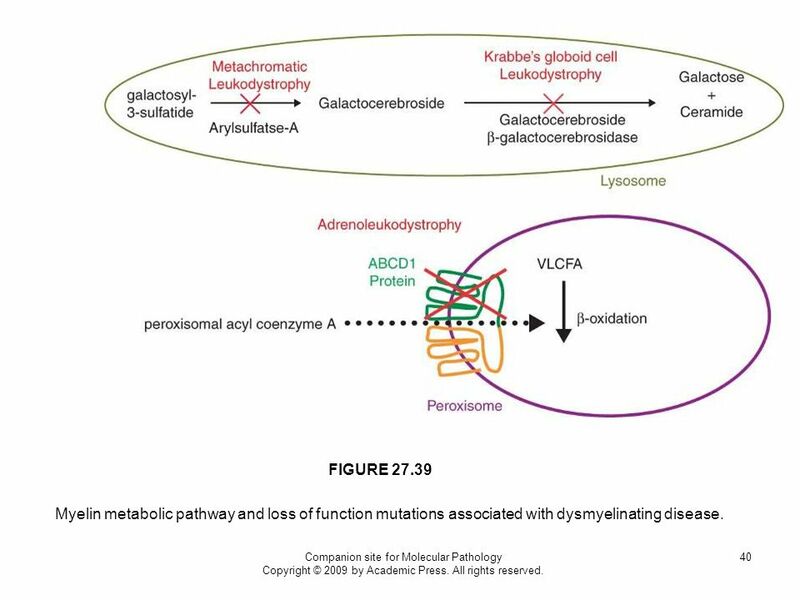 40 FIGURE 27.39 Myelin metabolic pathway and loss of function mutations associated with dysmyelinating disease. Companion site for Molecular Pathology Copyright © 2009 by Academic Press. All rights reserved. 41 Photomicrograph of old demyelinating lesion in multiple sclerosis. 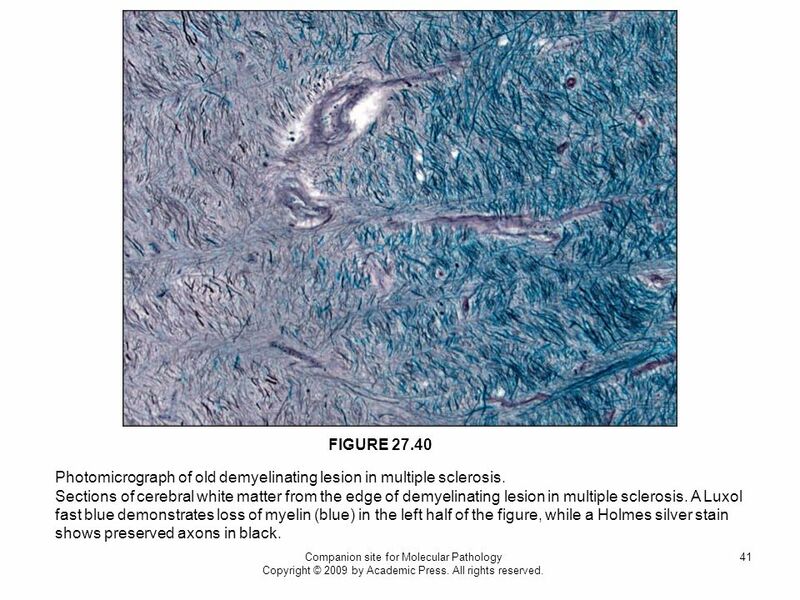 FIGURE 27.40 Photomicrograph of old demyelinating lesion in multiple sclerosis. Sections of cerebral white matter from the edge of demyelinating lesion in multiple sclerosis. A Luxol fast blue demonstrates loss of myelin (blue) in the left half of the figure, while a Holmes silver stain shows preserved axons in black. Companion site for Molecular Pathology Copyright © 2009 by Academic Press. All rights reserved. 42 CNS directed autoimmunity in demyelinating disease. 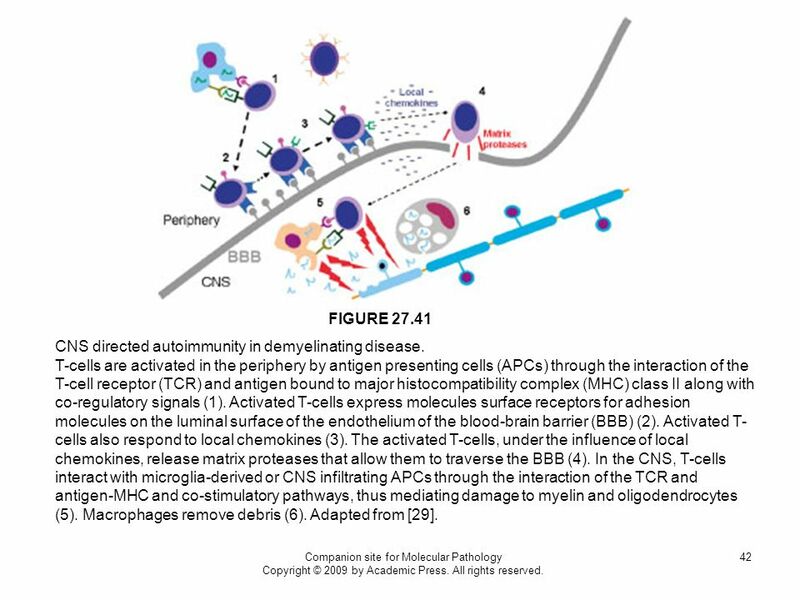 FIGURE 27.41 CNS directed autoimmunity in demyelinating disease. T-cells are activated in the periphery by antigen presenting cells (APCs) through the interaction of the T-cell receptor (TCR) and antigen bound to major histocompatibility complex (MHC) class II along with co-regulatory signals (1). Activated T-cells express molecules surface receptors for adhesion molecules on the luminal surface of the endothelium of the blood-brain barrier (BBB) (2). Activated T-cells also respond to local chemokines (3). The activated T-cells, under the influence of local chemokines, release matrix proteases that allow them to traverse the BBB (4). In the CNS, T-cells interact with microglia-derived or CNS infiltrating APCs through the interaction of the TCR and antigen-MHC and co-stimulatory pathways, thus mediating damage to myelin and oligodendrocytes (5). Macrophages remove debris (6). Adapted from . Companion site for Molecular Pathology Copyright © 2009 by Academic Press. All rights reserved. 43 Photomicrograph of Progressive Multifocal Leukoencephalopathy (PML). 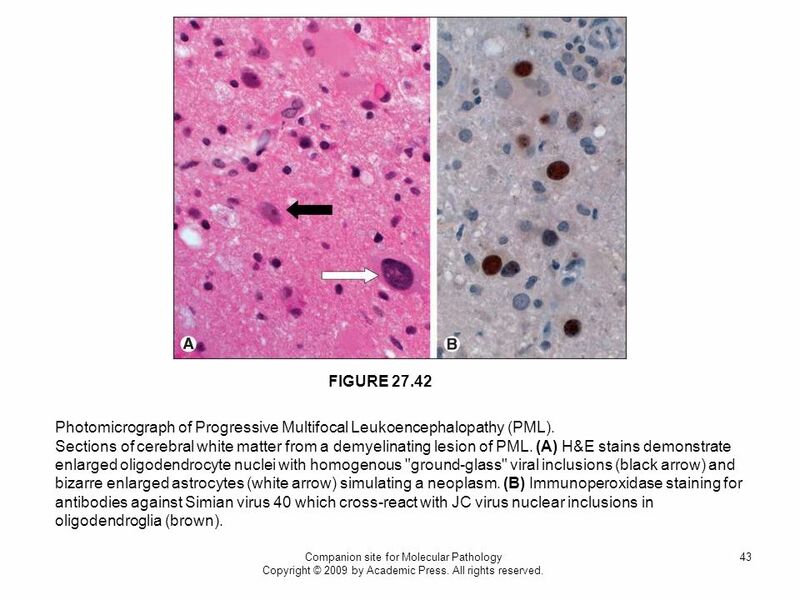 FIGURE 27.42 Photomicrograph of Progressive Multifocal Leukoencephalopathy (PML). Sections of cerebral white matter from a demyelinating lesion of PML. (A) H&E stains demonstrate enlarged oligodendrocyte nuclei with homogenous "ground-glass" viral inclusions (black arrow) and bizarre enlarged astrocytes (white arrow) simulating a neoplasm. (B) Immunoperoxidase staining for antibodies against Simian virus 40 which cross-react with JC virus nuclear inclusions in oligodendroglia (brown). Companion site for Molecular Pathology Copyright © 2009 by Academic Press. All rights reserved. 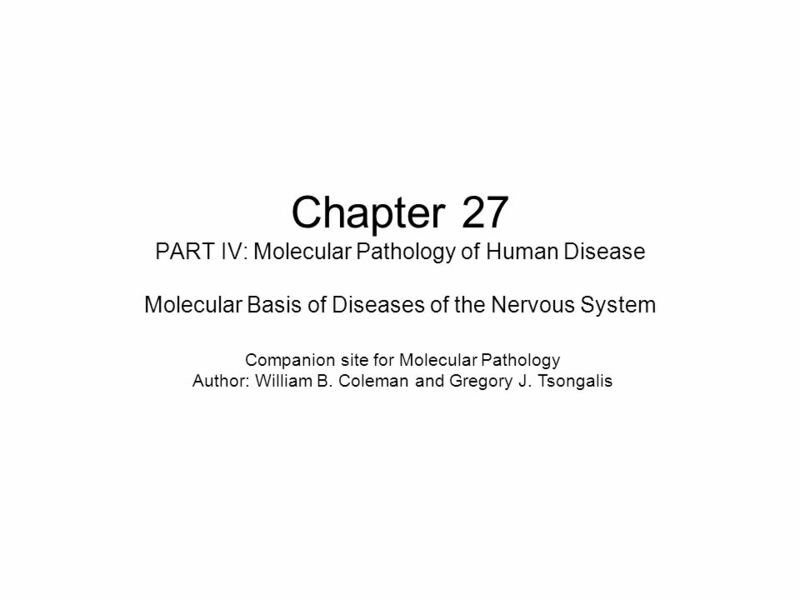 Download ppt "Chapter 27 PART IV: Molecular Pathology of Human Disease Molecular Basis of Diseases of the Nervous System Companion site for Molecular Pathology Author:"
What does a Nervous System do for you? Detect (sense) changes in the environment (light, sound, smell, taste, touch, heat) Detect (sense) changes in the.